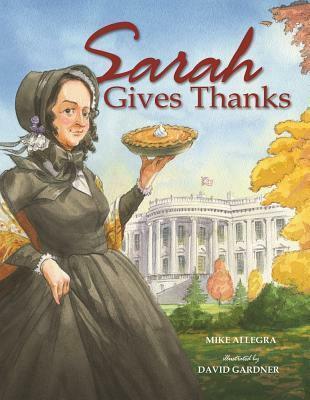 My friend Mike Allegra's first picture book Sarah Gives Thanks (Albert Whitman & Company; illustrated by David Gardner) was released September 1st. Not only is it his first book, but it is really good. Just read these reviews if you don't believe me: Kirkus and School Library Journal. I had the opportunity to interview Mike. Lauri: You dedicated your first book to your wife, Ellen, who I know from your blog is disorganized, peppy, sociable, friendly, and a donkey whisperer. Plus, like I do with my husband, she plots your death when you pepper her with ideas late at night. Was the dedication a big decision? Mike: It might be a big decision, but it wasn’t a difficult one. Dedicating the book to Ellen keeps her from smothering me with a pillow when I finally fall asleep. Oh, and she is also my soulmate. So there’s that. If a publisher trusts me enough to give me a second book contract, that book will be dedicated to my son. The third book will be dedicated to my parents. And the fourth book will be dedicated to the person who offers me the largest bribe. Lauri: *Hands Mike $5 bill* You have helped me gain perspective on rejection letters with your story of receiving over a hundred. I aspire to eclipse your record. What did you learn from rejection? Mike: Well, good luck with that goal of yours. I have quite a head start on you and, even with a well-received book under my belt, I’m still getting kicked to the curb. It’s the price a person’s gotta pay for wanting to be a storyteller. The key to handling rejection is to never take it personally – because it isn’t personal; the odds are simply against you. Everybody in the world thinks they can write a book and many of those people are bombarding publishing houses with their efforts. It’s getting harder and harder to get yourself noticed. All you can do is keep writing, keep getting better, and keep sending stuff out. Lauri: Someone else with perseverance, Sarah Hale, is the heroine of your book Sarah Gives Thanks. The book opens with straight up sorrow – the children's sadness, the mother's sadness yet need to be strong for her children, and her immediate concern of supporting her family. It took me a few tries to get through the first spread, kind of like watching Finding Nemo. How did you decide on the beginning of the book? Mike: It felt natural to begin there. I just couldn’t help but imagine what that first Thanksgiving without David Hale – Sarah’s husband and the father to her five young children – must have felt like for that family. David died about six weeks before Thanksgiving, so the family didn’t have much time to grieve; their emotions were still raw. The holiday, a time that was supposed to be joyous, was filled with sorrow and fear about the future. I also wanted to start there because that moment is when the story of a nationalized Thanksgiving really begins. It was the day Sarah got her life on track. Counting her blessings helped her to get through a very difficult time; Sarah knew that Thanksgiving could also help others in similar ways – and she spent the next 36 years spreading that message. Lauri: I understand that tragic first spread was inspired by Sarah's own semi-autobiographical story. You also found magazines Sarah edited in the 1800s. 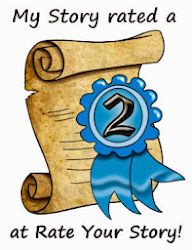 During research how many times did you come across something where you shouted "Yes!" and everyone in the library turned to stare at you? Mike: Most of my “Yes!” moments were in a historical archive – or as I call it, a library on steroids. The people who work at places like that don’t stand for anything. I actually was on the receiving end of a very long, strong lecture because I was taking notes with a ballpoint pen. Only pencils are allowed in the archives, apparently. I had no plans to doodle on the historical documents, but I must’ve looked like the kind of person who might do such a thing, hence the lecture. When you’re dealing with people that stern and officious, you do not shout “Yes!” under any circumstances. Lauri: I hate being places where I can't randomly yell things. Like "I love Lincoln"- who is my frickin' favorite president. (I used to smooch $5 bills, a habit that led to me becoming an accountant-type.) Lincoln made Thanksgiving a national holiday in October 1863 in the midst of the civil war. My calculator beep boop beep boop says Thanksgiving 2012 will the 150th national celebration. I think all those rejection letters, editor changes, and delays may have been karma. Could the timing be better? with a beard like Lincoln's? Mike: The timing is pretty perfect, isn’t it? I, too, am a big, big Lincoln fan, by the way. He was our only great bearded president. We had other bearded presidents of course. Grant springs to mind, but once that guy left the battlefield for the White House he was pretty much useless. Lincoln is all we have, beard-wise. If you want another great president with facial hair, you have no other place to turn but to Teddy Roosevelt – and he only had a ‘stache. Lauri: Thank you so much for sharing Sarah's story with me. Even as a fully grown woman, the story gave me pause. I'll quote one page: "A woman was expected to be a housewife and mother. She didn't need a college education to do those things." Though I had the privilege of attending college and working a fancy corporate job for a decade, I chose to stay home with my kids two years ago. Some days I feel silly having the not-currently-in-use-degree. I suppose the beauty is I had the choice. Mike: The wonderful thing about Sarah is how strong an advocate she was for women’s education. She didn’t care what a woman did with her education – in fact Sarah was very much a traditionalist when it came to a woman’s role in society – but, by God, she wanted every woman to have that education. Sarah firmly believed that if one was not always learning, one was not really living. And, of course, she was absolutely right. Lauri: Yes, she was. Good luck with the book! Stop by Mike's site heylookawriterfellow (btw he should have named it heylookawriterdude because I thought it was "heylookafellowwriter" for months.) If you want to hear more about Mike's career, check out Susan Rocan's interview or about how Mike came up with the idea for the book, read Roxie's interview. I fully intend to one day kiss a $10,000 bill featuring the portrait of Salmon P. Chase. In fact, I'd like to kiss lots of them, especially if they were in my wallet! According to Wikipedia, there may be as many as 336 $10K notes still around. And Mike, like Sarah, Salmon's mother was widowed in 1817 and was penniless with ten children to feed. Salmon eventually became Secretary of the Treasury, and was a huge thorn in Lincoln's side. But...he's on the bigger bank note! Cathy - I like the way you think. I am now picturing Donald Duck swimming through his bank vault of coins and dollars! Thanks for the super interview, Lauri! And hi, Cathy! Salmon P. Chase might be a good followup to Sarah (If only because his first name makes me giggle). Yes! I can't wait to see what you will dig up on Salmon. Great interview Lauri and Mike! 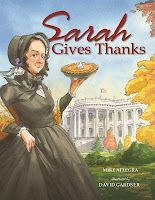 I can't wait to read SARAH GIVES THANKS. Congratulations, Mike, on your first picture book. Sounds like a great read. I am wondering how many of your rejection letters was for this PB (if any). Mike's book is fresh and original, it must have sold relatively quickly. Thanks Romelle- Mike is easy to interview. I know the answer on rejection letters but I hope Mike will pop on and tell you the story himself. Now the question is how do we go about finding these fresh and original ideas?!? Sarah Gives Thanks received no rejections, I'm pleased to report. My other picture books, however, received TONS. By the time I signed my first contract, I had 114 "thanks but no thanks" letters to my credit. I am oddly proud of this - not because I enjoy failure, but because I turned out to be far more persistent that I ever thought possible. Oh Mike, you inspire me. I am now coveting a pile of rejection letters to call my very own. Lauri always inspires me with her quirky sense of humor. Is there anything better? Why, no doubt, your new book.